At Camp Can-Aqua we recognize the value of each individual, encouraging them to challenge themselves through learning, exploration and responsible risk taking. Understanding the power of the imagination, we create a world that is engaging, inclusive and full of wonder, where children develop a strong sense of comfort and belonging. In this community, each child is able to recognize their importance as they are encouraged, supported and included in all aspects of camp life. Offering a co-ed camp experience for kids ages 5-16 for 1,2 and 4 week stays, we are a camp for 200 kids each session. Camp Can-Aqua is a remarkable, camper driven summer camp! Campers arrive to a welcoming accepting environment. Once here, they quickly realize that the world of camp is a place they can comfortably express themselves, develop friendships and gain skills at a wide range of thrilling activities. At Can-Aqua we are not only proud of what we have, but also what we do and how we interact. Exceptional instruction opportunities, partnered with a remarkable community feel make Camp Can-Aqua a very unique and special place. Located just outside of Bancroft, Ontario, we’re a proud member on the Ontario Camps Association (OCA) and the Canadian Camping Association (CCA). Membership in these organizations ensure a high level or professionalism and expertise in all things camp! We are also proud to be rates as one of North America’s Top Summer Camps. Click here and register to join us to EXPERIENCE CAN-AQUA! For over 30 years, Can-Aqua has been successfully using our program board to ensure campers are given control of their schedule on a day to day basis. Each evening at dinner, kids rotate by cabins as they head out to choose their next day’s adventure. We love this system, because not only does it give kids a sense of ownership on their time and control of their day, but it also teaches the importance of compromise and encourages kids to participate in what they know but also to try new things. A typical day is comprised of four activity periods, a single period of free time and an evening program. Once signed up, attendance lists are created for the following day and campers are expected to be at their activities ready and on time. At Can-Aqua we tell kids that while you don’t have to do anything…you must do something! When you have your own private lake, you’d be crazy not to have tons of programs on the water! On any given day, our lake is filled with boats, swimmers and excitement. Our exceptional instruction is partnered with some terrific and creative options so kids can choose between improving a skill or splashing around. 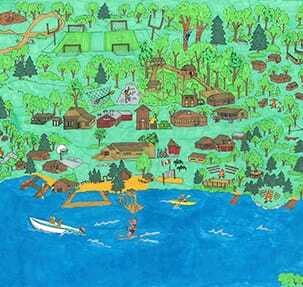 With both active and passive land programs, campers will always find something to spark their interests. Simulating creativity while at camp is something we feel is an important part of the overall experience. Every night is a new adventure at Camp Can-Aqua during Evening Program. Will it be a running game, like Capture the Flag or Battleship? Will it be an adventure, like Councillor Hunt, Can-Aqua Carnival or Clue? Which song will your cabin perform a lip sync and dance to for “Air Bands”? 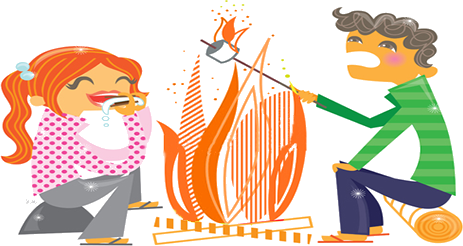 How about a creative skit at Campfire? Every year there are new activities and games, including recent additions such as Phobias, Risk and Iron Chef Can-Aqua. 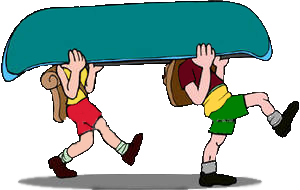 If going away to camp is about having fun, gaining independence, learning to work with others and discovering the beauty in our natural surroundings, then taking part in a canoe trip while at Camp is a terrific opportunity!!! Suddenly, all the luxuries of city life disappear and campers are left with only each other to make their experiences memorable. It takes teamwork and selflessness to accomplish all tasks and compromise is essential when camping with your cabin. Taking some time to enjoy a canoe trip, even for one night, is an incredibly rich opportunity. While at Can-Aqua we believe in the value of our programs and interactions on site, we are also huge supporters of the benefits children receive from the experience of a outtrip. At Can-Aqua, our campers spend a good part of each typical day engaged in activities that are both exciting and educational. For this reason, we place terrific emphasis on the quality of instruction that we offer. We offer 2,3 & 4 week programs, our instructional based focus allows kids to select and excel in a variety of activity options. These shortened stays are perfect for curious first timers & younger siblings. Our 8 day is an important minimum for personal growth. Experience The Magic of Camp Can-Aqua as a Family. These weekends are great for parents and kids. Specialty Camps at Can-Aqua are designed to offer kids with specific passions a specialized focus, while still a part of camp. 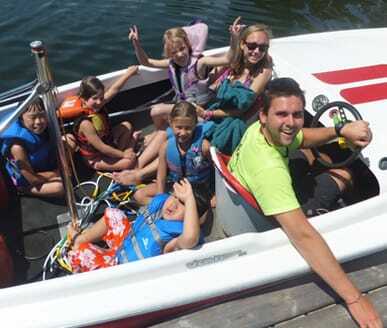 Can-Aqua Day Camp brings FUN, exciting and memorable outdoor experiences and stimulation for children ages 5-11. Situated on 160 acres of stunning Ontario landscape (and on our very own private lake), Camp Can-Aqua is a slice of paradise! Our exceptional instruction teaches kids skills they will take with them throughout their lives. Our leisure programs ensure summer campers have the perfect mix of skill development and crazy fun. 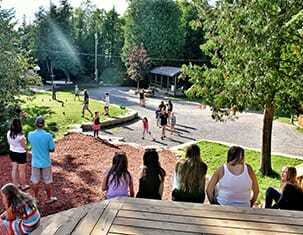 A camper community of up to 160 kids, no child goes unnoticed at Camp Can-Aqua!